The Moovapps Supplier Service Portal hosts all interactions between you and your suppliers for paper-free communication. You can manage listed suppliers, RFQs, orders and invoices all from a single location. You can also share technical documentation and communicate with your suppliers at all stages of your project from quote to manufacturing. The portal also manages supplier quality, tracking product returns, defects, corrective measures and audits. The retail industry is fast paced, and responsiveness is crucial. This is especially true when it comes to managing your suppliers. Your suppliers have to be able to reach you, whether it is to ask a question, raise an issue or make a complaint. 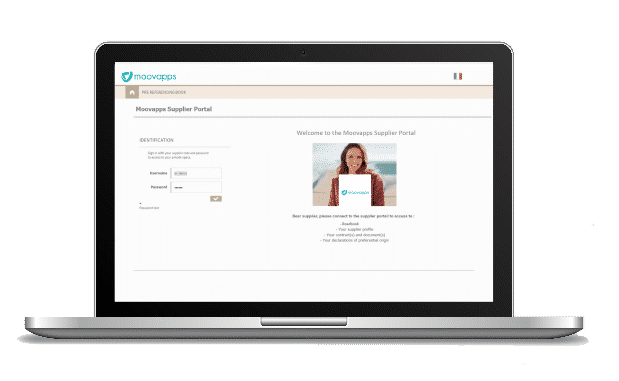 With the Moovapps Supplier Service Portal, communicating with your suppliers is easy. All interactions are saved in the relevant supplier’s record and communication is fully traceable. The Moovapps Supplier Service Portal lets you share product specifications, purchase orders and contracts with your suppliers. You get a 360° view of your interactions with your suppliers, saving you time every day. All of the financial aspects of your supplier relationships are available on the platform, from managing RFQs and listing new suppliers to tracking orders, invoices and payment authorisations. When used with Moovapps Quality Management, Moovapps Supplier Service Portal manages product defects, corrective measures and supplier audits. It has everything you need to continuously improve the quality of your products and services for greater customer satisfaction!